It isn't traditionally an Easter cake, and it isn't Swiss (it's from Linz, Austria), but I like any excuse to make this buttery and jammy classic from just over the border. The Swiss make a chocolatey variety, the St Galler Klostertorte, (my recipe here) which Marianne Kaltenbach, grande dame of Swiss food history, names as an Easter bake. 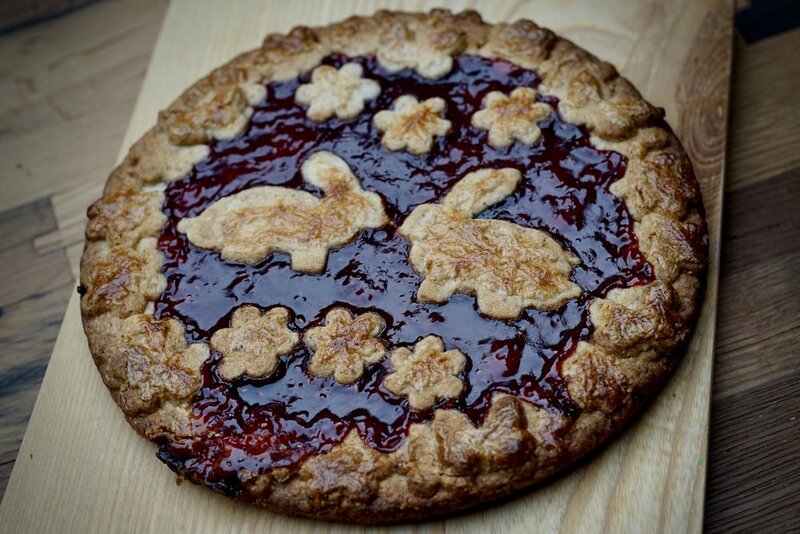 Indomitable Swiss cookbook author Elisabeth Fülscher also has an egg-shaped, bunny-embellished Linzer Torte as an alternative Easter dessert. You can decorate your jammy creation however you see fit—covering it with a traditional lattice, or cutting out bunnies and blooms with cookie cutters and arranging them at will. Fülscher even adds additional marzipan eggs and rabbits after baking. 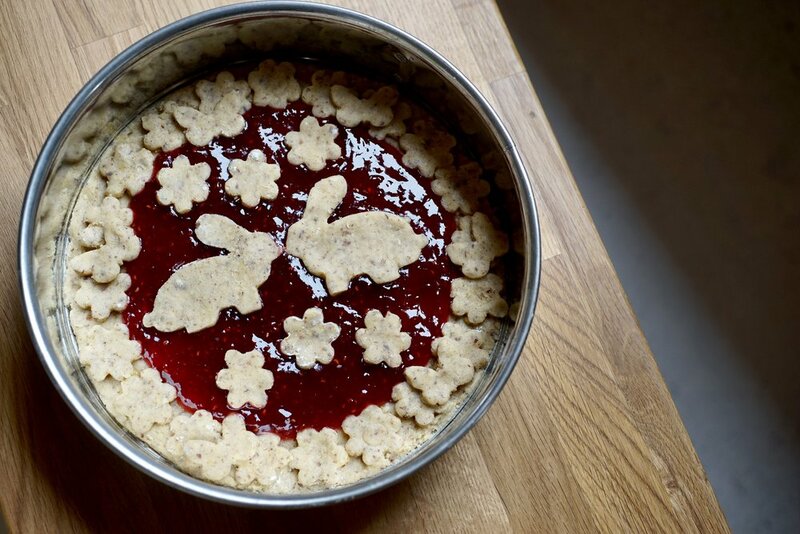 I consulted the aformentioned recipes, from the Fülscher Kochbuch and Kaltenbach's Aus Schweizer Kuchen, as well as my grandmother's recipe, which uses red currant jam and no added lemon. Preheat oven to 190 C / 375 F / gas mark 5. Line the bottom of a 26 cm (10 inch) round tart pan or springform pan. In a large bowl, whip the butter, sugar and zest together until fluffy and pale. Add the egg and mix well. In a separate bowl, whisk together the flour, nuts, cinnamon, and salt. Add to the wet ingredients and mix just until combined. Wrap with plastic and let cool in the fridge for about an hour. 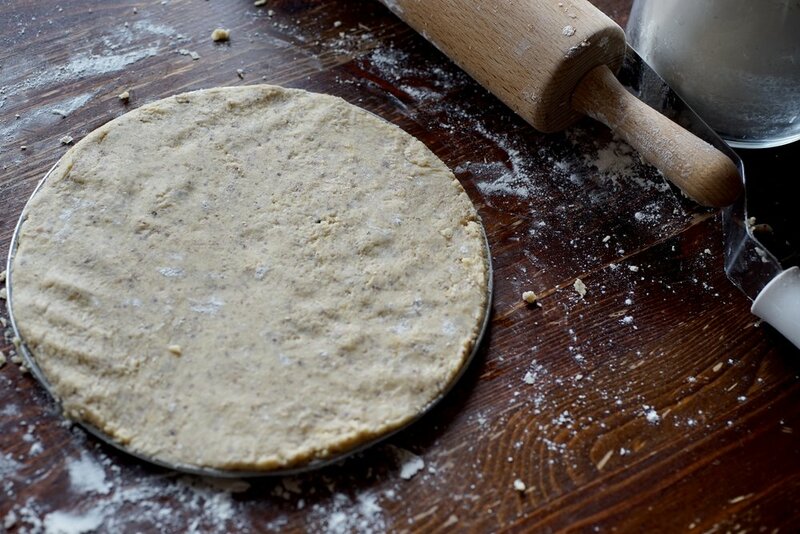 Once cooled, use a little flour and roll out two thirds of the dough into a circle. Place this into the bottom of the pan. Because the dough is tender and prone to breaking, you can also put it in in pieces if that's easier than rolling out a whole circle. If there are cracks, lightly press in some extra dough. For the rim of the torte, you can either cut out enough shapes from the remaining third of the dough to form an edge (as above), or you can simply roll some of the dough out into a long tube and press it along the perimeter. 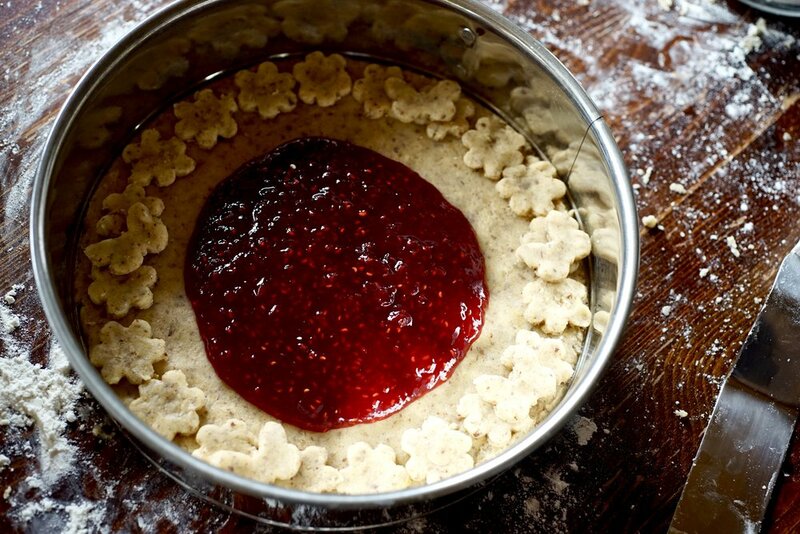 Once the rim is made, whisk the jam with lemon juice and spread it over the torte. 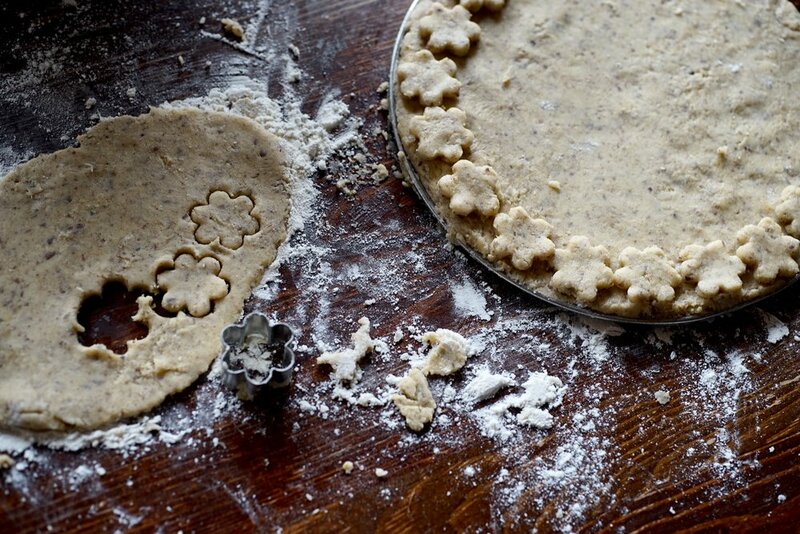 Roll out the remaining dough and make some decorations. There is no prescribed shape or method. It could have a lattice top, or sometimes forms are simply cut out and arranged at will. Lightly beat the egg and brush it over the dough. Bake for about 35-40 minutes or until the jam is bubbling and the crust has browned nicely. Both ground hazelnuts or almonds are used for Linzer Torte, though hazelnuts seem to be preferred. Other red jams can be used, though if you use something quite sour, skip the lemon juice. You can also spike the jam with booze if you see fit.